Having won the Best Editing Oscar for In the Heat of the Night (1967) and been nominated previously for The Russians Are Coming! The Russians Are Coming! (1966), Hal Ashby went on to become one of the most respected directors of the movie brat generation, one whose directorial credits include Harold and Maude, The Last Detail, Bound for Glory and Coming Home, which landed him his only Best Director Oscar. His rarely seen directorial debut, The Landlord (1970), tells the story of a young, white entrepreneur, Elgar Enders (Beau Bridges), who becomes the landlord of an inner-city tenement, with the intention of evicting the present occupants and constructing a luxury home for himself. What he doesn't anticipate is the opposition he faces from the current low-income, streetwise residents. In the course of their dispute he unexpectedly starts to become fond of them and abandons the development, instead planning on a restoration. He even romances black tenants Lanie (Marki Bey) and Fanny (Diana Sands). But his naivety creates unforeseen problems and raises the question of whether true harmony can ever exist between people of such varying social and ethnic backgrounds. In the early seventies, with the impact of Martin Luther King Jr.'s death still raw, films exploring the impact of racial prejudice and mixed-race relationships were a rarity but The Landlord was an exception, a mix of social satire, urban drama and high comedy. The cinematographer was the great Gordon Willis, who in the next two years would also photograph Klute, The Godfather and Bad Company and would later be nominated for Best Cinematography Oscars for The Godfather, Part II and Zelig. 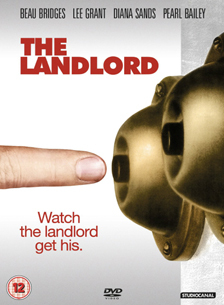 The Landlord will be released on UK DVD on 1st October 2012 by Studiocanal at the RRP of £15.99.